‘Scott's Cumbrian Blue(s), Landscape (Wil Hefe and Rocd Rosort)’. 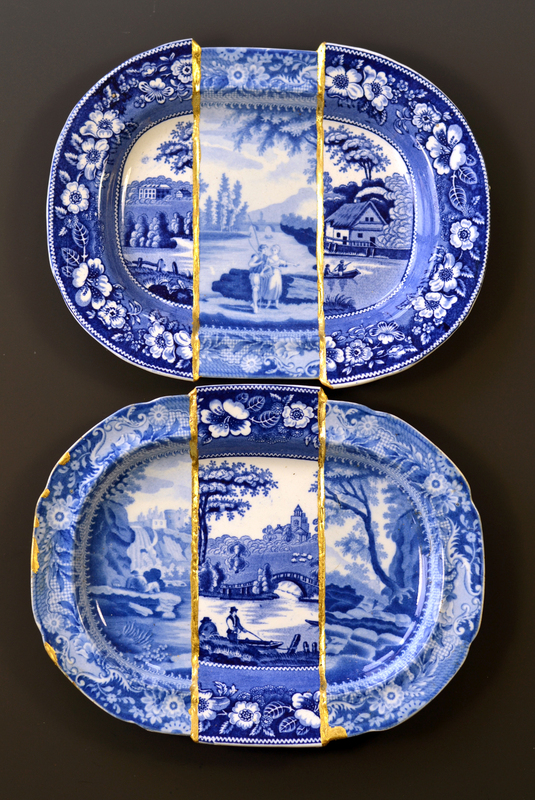 Collage, cut and re-assembled 19th century transferware platters (‘Wild Rose’ unknown maker and ‘Castle Rochefort’ by Brameld) with Kintsugi. Each 268mm x 210mm x 28mm. Paul Scott 2018. ‘Scott’s Cumbrian Blue(s), Landscape (Wil Hefe and Rocd Rosort)’. Collage, cut and re-assembled 19th century transferware platters (‘Wild Rose’ unknown maker and ‘Castle Rochefort’ by Brameld) with Kintsugi. Each 268mm x 210mm x 28mm. Paul Scott 2018.